Saturday the seventeenth was cold! Very, very, very, cold. Multiple layers of clothing and still cold. Nonetheless, I had promised to make an expedition to Greenwood Cemetery to get some shots of the Monk Parakeets that live atop the gothic gate at the main entrance of the cemetery, so, cold or no cold, I was going. I was joined by my friend Pam, who lives in the neighborhood and who dedicated 10,000 Birds readers have met before, and after a nice brunch at a local coffee shop we made our way down the street to Greenwood. While we were still a block from the cemetery we could hear the raucous squawks of the flock, a strange sound on so cold a day. We were happy to see several of the monks perched on top of the gate, in and on their nests, and flying past us. They were pretty fluffed up, better to stay warm, and a couple pairs stayed tightly huddled together. Even though the temperatures were well below freezing a couple of the birds stayed busy doing nest maintenance. It was fun to watch them through the scope as they manipulated sticks into the exact position that they wanted. 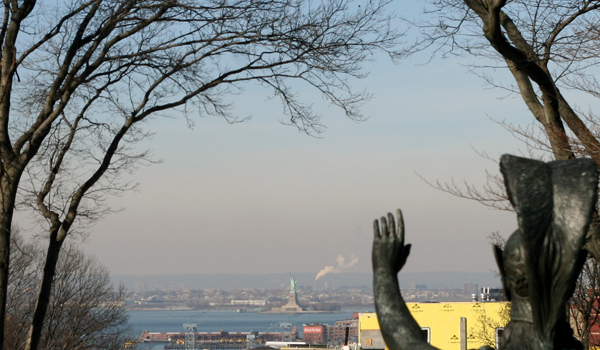 After watching and photographing them for a bit we started to get cold and decided that more walking would warm us up so we headed deeper into the cemetery and enjoyed the view from the highest point in Brooklyn. On the way back to the entrance I took this shot of the gate, just to give an impression of its size. The nests are visible on the center and right towers if you look carefully. Then, back at the gate, before I could get my camera back on the scope, two birds flew by and I managed to get one shot with just the 50mm lens, not exactly the ideal flight shot but enough to give a sense of how Monk Parakeets appear in flight. 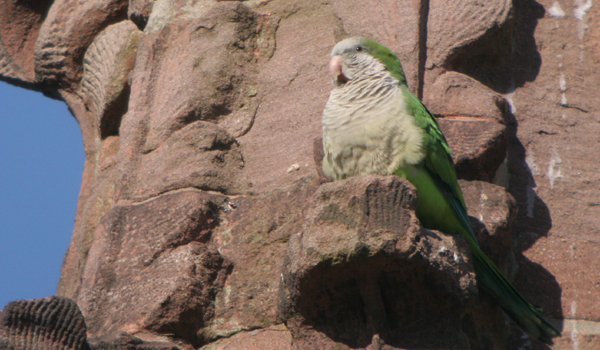 I highly recommend a visit to Greenwood Cemetery: it is easy to get too, accessible, and worth the visit for the views and history in addition to hosting Monk Parakeets. 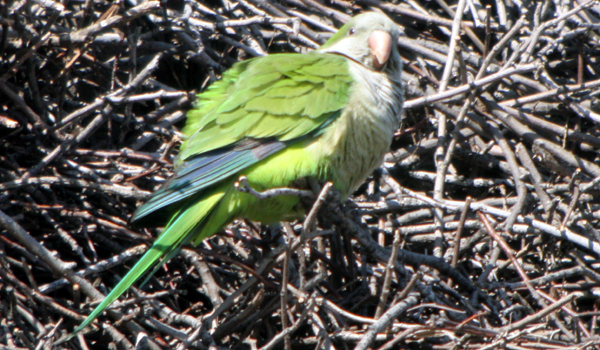 I first heard of Monk Parakeets from my daughter, who was a student at Univ. 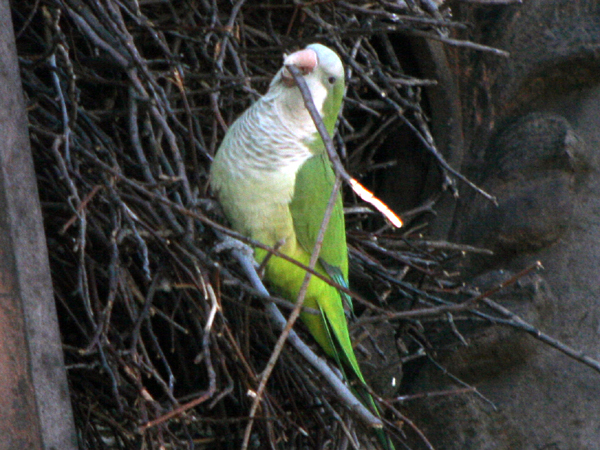 of Chicago and had an assignment to map the Monk Parakeet nests in Hyde Park, the area around UofC. They are all over the area, which is strange when you think about how cold it is in Chicago and that Hyde Park is right on Lake Michigan. The parakeets originally nested in Washington Park, and there is a whole folklore about how Mayor Washington, who lived on the park, loved them and wouldn’t allow the parks department to remove them. They are so loud, some people won’t live in apartments that face the park. I also saw naturalized populations of Quakers in Barcelona when I visited Spain for a conference back in 2006. It was wonderful walking down the boulevard to the World Trade Center and hearing the familiar sound of Quakers in the palm trees where they were nesting. Thank you for this wonderful site, 10,000 birds. @Donna: It is amazing how many people cherish these birds, isn’t it? @Patricia: You’re welcome! And thanks for the kind words. I live in Edgewater, NJ, where we have a large flock of Monks. I get to Greenwood once or twice a year. Much better in warm weather. Love the shot behind Minerva. I visited Green Wood last year and had not known about the birds until I looked up and saw the nests; asking about them I learned how long they have been living there – The tour and Jeffrey Richman’s vast knowledge prompted my purchasing his book and learning more about this most fascinating place. I look forward to another visit in the Spring. 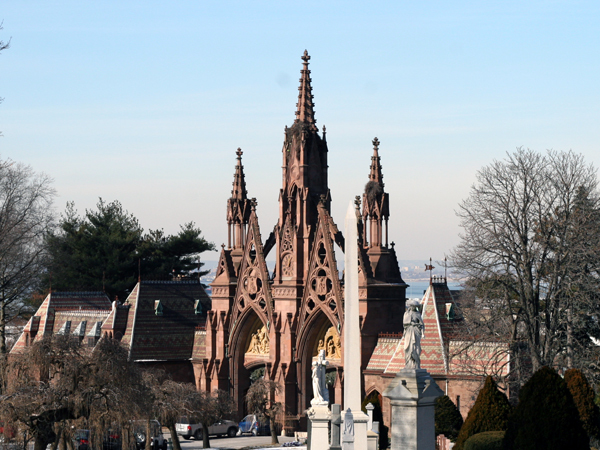 I was in Brooklyn, NY to see the Brooklyn Museum, but decided to check out the Greenwood Cemetery first. I am sorry I missed seeing the Monk Parrots at the main gate. If I had known about them, I would have definitely made an effort to see them. This cemetery is not only very historic, but the grounds are kept in wonderful condition. I have been to many cemeteries (for historical purposes and to photograph the wonderful sculptures that can be found) and found this cemetery to be even more impressive than Woodlawn Cemetery in the Bronx. It was better maintained and I didn’t have to sign a release form to take photos of the various gravesites. Ah, the Greenwood Parakeets. When I visited the cemetery a tour guide told me that the way they got there was that they fell out of a Pet-Store Truck. I’m not sure if it’s true, but it sounds plausible to me. 😀 Anyways, beautiful shots. The cemetery is so cold on highest point!